Like Japan (here’s our guide to applying for a Japan Tourist Visa for Filipinos), Filipinos also need a Travel Visa for South Korea to be allowed entry to the country, so here’s our guide on how to apply for a South Korea Tourist Visa for Filipinos. The land of Kimchi and KPop, South Korea, has been one of the favorite travel destinations for Filipinos for the past years. Maybe it’s the influx of Koreans here in the Philippines that may have sprung curiosity out of Filipino’s minds to visit South Korea too. We were actually hesitant to book for South Korea because the available flights when we checked the airline promo was just 3 months after our flight to Japan. If we do the simple Math, Japan + South Korea would equal to disaster for our wallets, but we still booked for the flight. When we heard that the Consulate of the Republic of Korea is already open in Cebu, we decided to personally submit our requirements directly to the embassy to avoid paying extra fees to a travel agency. At first, we were nervous since this is our first time to apply directly to the embassy, although we already have one OECD country (Japan) visa stamp in our passports. So here it is, sharing you tips and requirements for the first time applicants in applying South Korea Tourist Visa in the Philippines. Please note that this article only contain the requirements needed for Employees and Businessmen without a Sponsor/Guarantor. If you are looking for other requirements depending on your status(i.e Filipino Married to Korean, Study in Korea), you can directly visit the official website of Embassy of the Republic of Korea in the Republic of the Philippines. Helpful tip 1: Since this application is for ‘no guarantor/sponsor’, then it would be much better if you could also submit booked plane tickets and accommodation. Helpful tip 2: If do not have a personal ITR, you can simply write a Letter of Explanation and addressed to the Consulate-General of South Korea. Helpful tip 3: We’re not sure as to what the minimum amount you should have on your Bank Certificate because the Embassy of South Korea nor any of the travel agencies never disclosed this information. Just make sure your bank account is opened for at least 6 months from the date you applied for a visa. Helpful tip 4: If you are applying with your baby, photocopy all your documents and attach it to your baby’s documents (Visa Application Form, 1 piece Passport size colored picture, Original Passport, Photocopy of Passport Bio-Page, Original & Photocopy of valid OECD visas & stamps). If you have all your documents ready and complete, you can directly visit the Consulate of Korea in Cebu. How many days will it take to process the Tourist Visa in the Philippines? As for the First Time Applicants, it usually takes 5 working days. For Frequent Travelers, it will only take 3 working days. How much is the visa processing fee of South Korea Tourist Visa? If you are staying in South Korea for 59 days or less, visa processing is FREE/GRATIS. If you’ll stay 60 to 90 days in South Korea, it will cost you PHP 1,800. 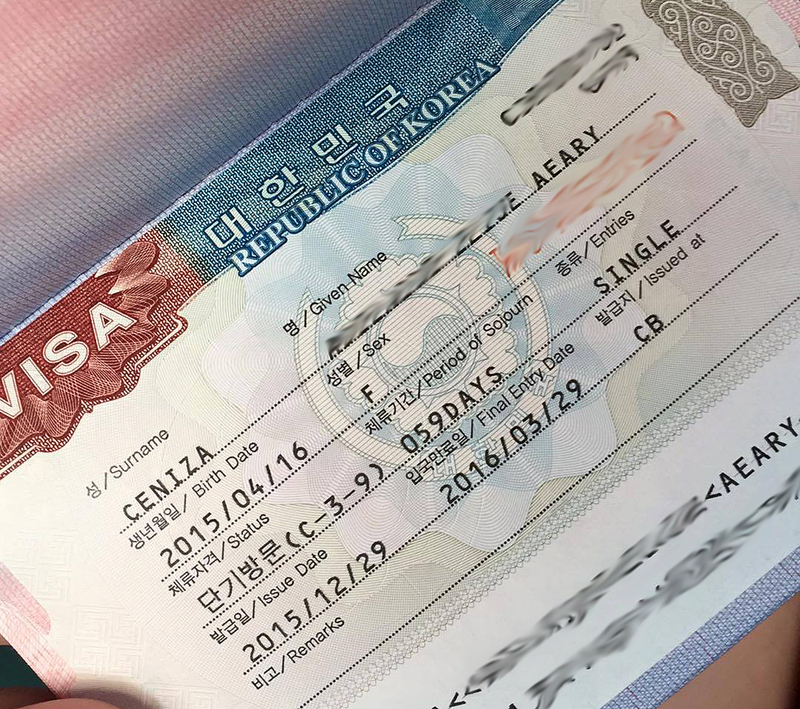 Last February 2015, the Embassy of the Republic of Korea in the Republic of the Philippines have announced new visa requirements which were implemented last March 2015. So, if you are planning to travel to South Korea, always check the embassy website for new updates. Hi. Im an employee but I dont have personal bank acct, but I have an invitation from my Aunt which is a Korean Citizen already? good morning maam i want to ask maam, my ante and her hasband korean,she want me to visit ther place,ano po ang gagawin ko kc pinahinto muna ako ng trabaho pra mg process ng requirmnts nnyo.,ano po ang gagawin ko..Kc ang alam lng nmin kong magvisit lng hndi n hanapn ng trabaho. Hi ma’am want to aply tourist visa because i have a foreign boyfriend working there.But I don’t know where I belong businessmen or employee…because I’m not a businesswoman and I don’t have a work.please hepl me. 1. How can I apply from here? 2. What are the requirements needed in applying for a visa? Hi, i’m appling for the student visa and my father will financially support me for the whole trip but he won’t be there. Will i need a sponsor/guarantor letter? Hello po…im planning to visit korea on september kaya lang ngyon pa lang ako nagopen ng bank account. Iaccept po kaya ng embassy ito para tourist vias application ko. Thanks po. Sir, I’ve been in Japan twice and Canada once this year. I want to apply for amultiple entry tourist visa so I can visit Korea on its different season. Do I have a chance to be approved?